The StingRay Jib Boom provides a convenient loading means mounted to the parts washer. 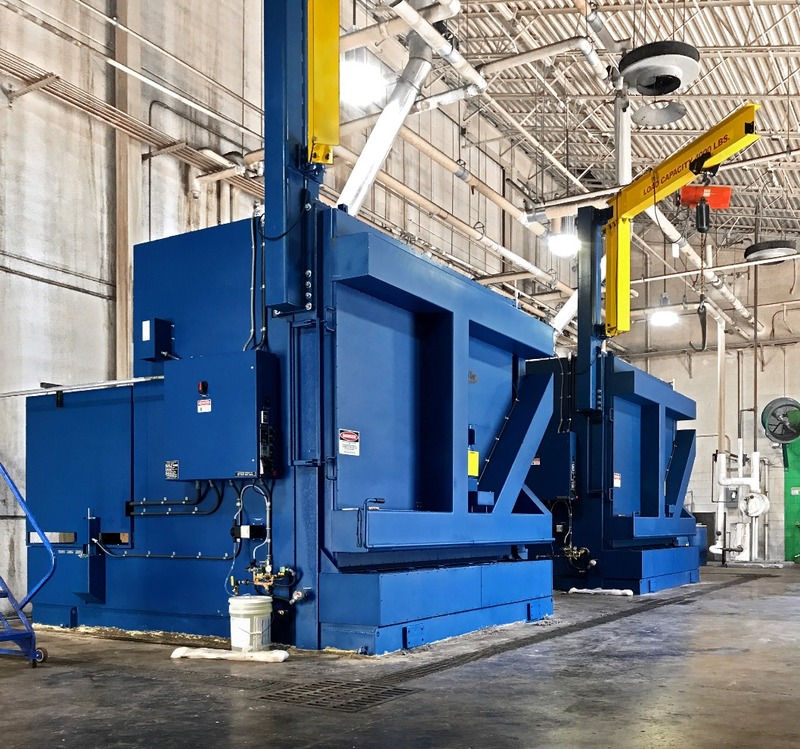 Eliminate waiting for the overhead crane to load parts on the turntable. The well engineered jib boom, with supplied trolley allows for easy inexpensive installation of needed overhead lifting equipment. No foundation or other structural enhancements are needed to the building. Pre-engineered simple bolt-on installation to the parts washer. 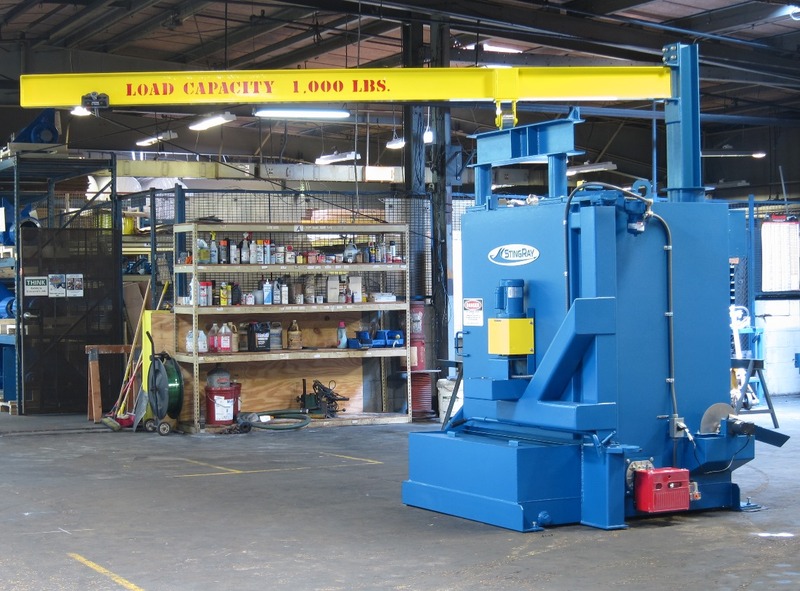 The machine mounted jib cranes maximize the utilization of space in your plant as they are freestanding and require no-floor space. 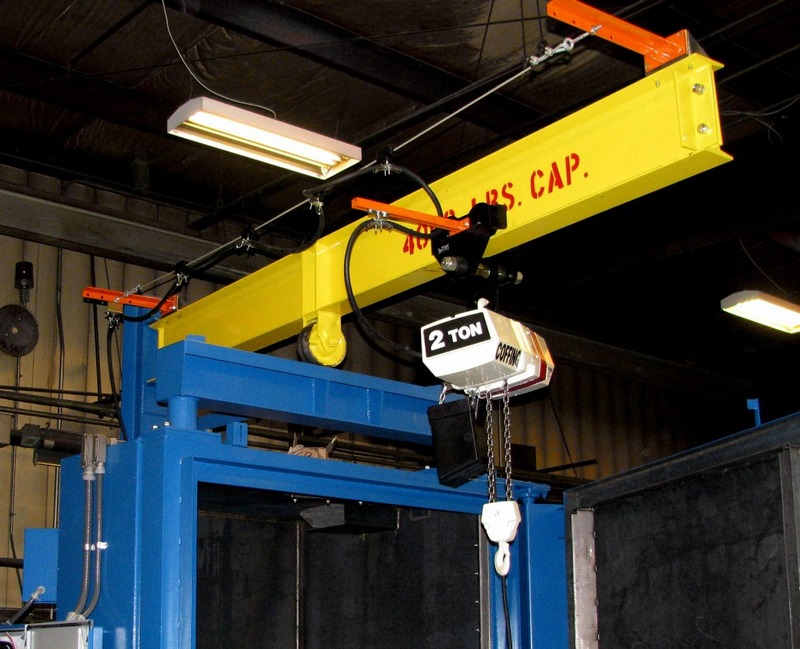 All steel components and fasteners are ASTM rated for lifting. 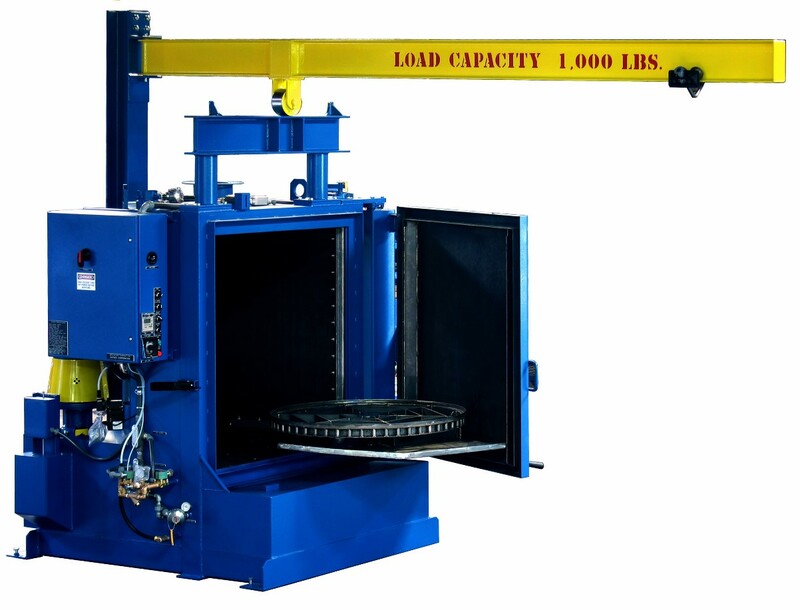 The boom capacity is sized to the parts washer, with a load capacity compatible with that of the washer turntable. 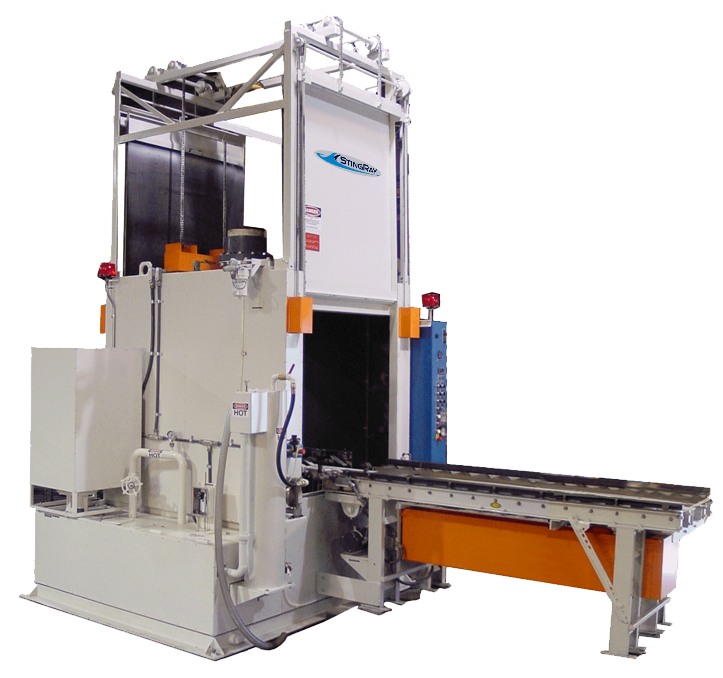 Use your own hoist or get the optional hoist system for full integration with the parts washer. Two styles of job booms are available. Rear Mount: Full turntable load capacity jib booms mount to the rear cabinet structure. 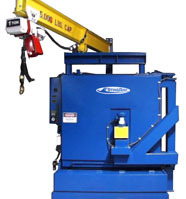 These swing booms provide sufficient lifting capacity and range of motion to load and unload the full diameter of the turntable without repositioning the door. Door Frame Mount: For lighter loads the highly maneuverable door frame mount jib boom provides a wide range of picking locations. 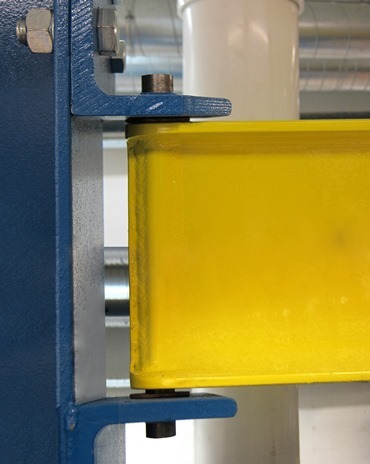 The lower mass boom and optimum corner location reduces operator fatigue and yet reaches the full turntable as well as the side of the washer. The 180 degree swing range allows storing the jib boom out of the shop isle way and clear of the loading area in front of the washer. 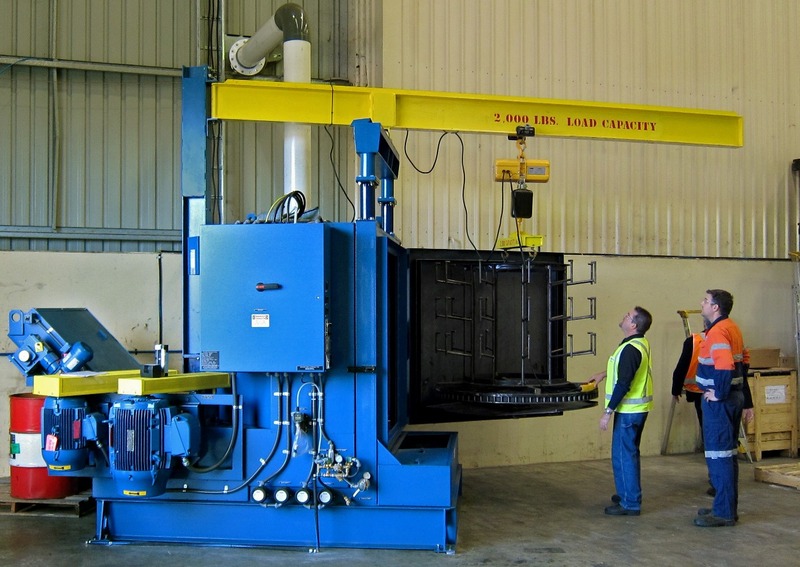 This clears the loading area and allows use of a forklift or overhead crane in tandem with the StingRay jib boom. Door frame mount style jib on StingRay SR100 parts washer. Rear mount style jib boom with hoist loading rail bearing fixture. Heavy-duty pivot connection and steel roller with precision ball bearings make the StingRay machine mounted Jib Boom easy to swing and operate. Installation is simple with pre-engineered bolt together connections. Adding a hoist to the StingRay Jib Crane is easy. 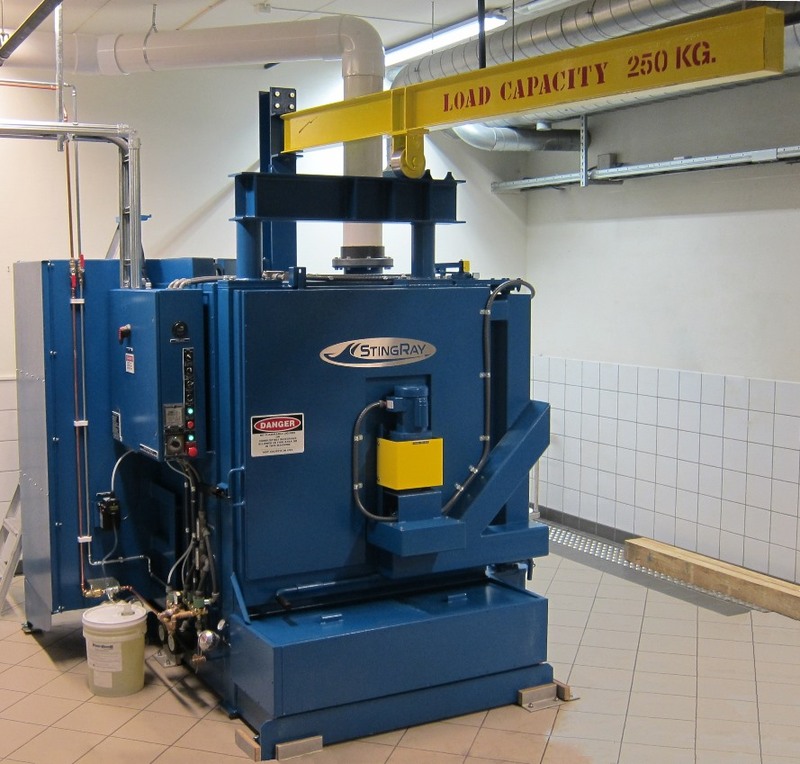 The optional hoist and cable management system integrated into the parts washer power supply makes installation ultra simple. 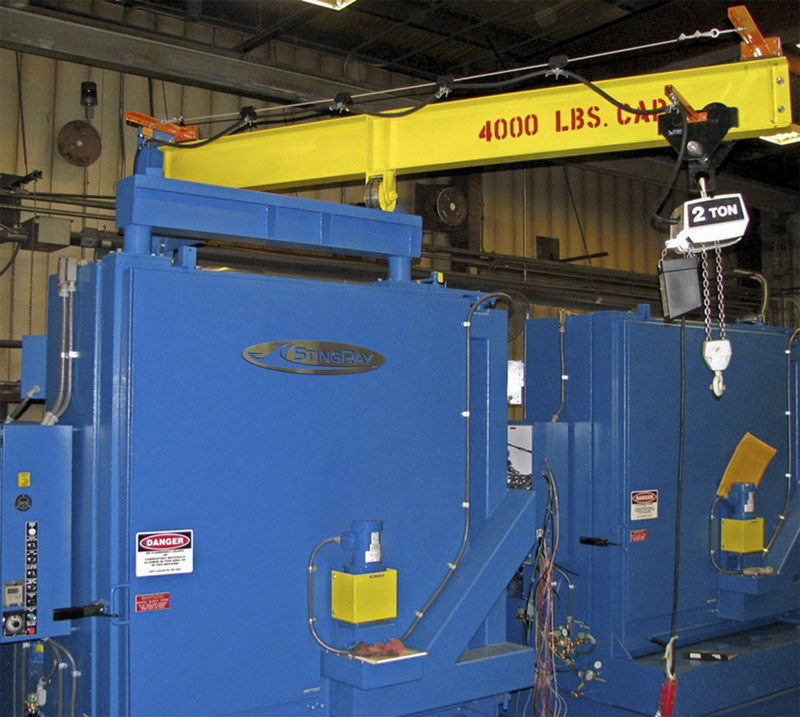 Various lengths of jib booms are available to provide reach farther from the parts washer. 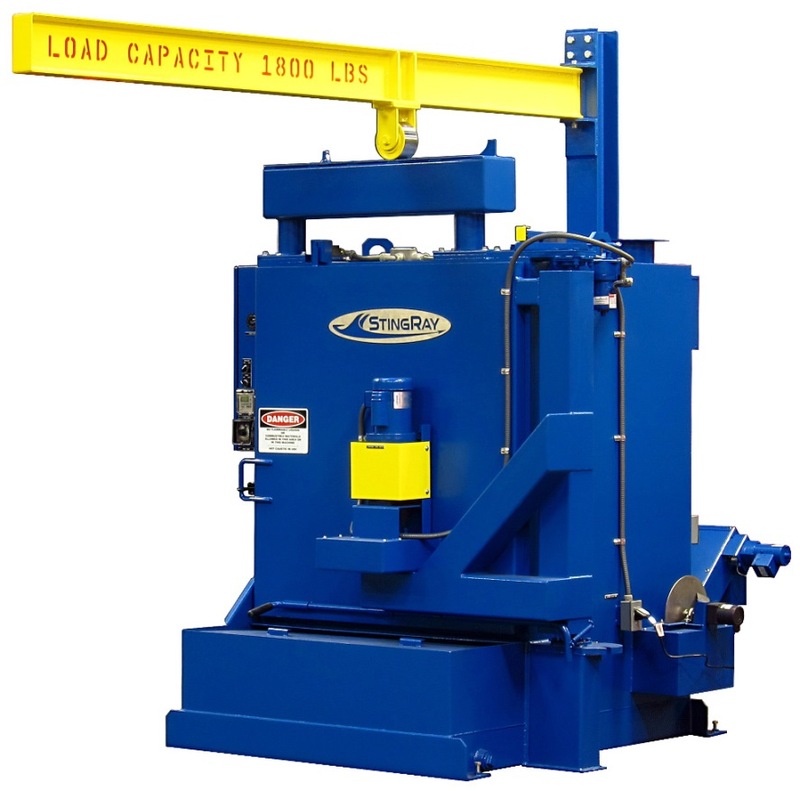 As the length increase the load capacity is reduced. Rear mount or door post mount jib booms provide easy installation for lifting and loading your StingRay without making any structural changes to your shop. 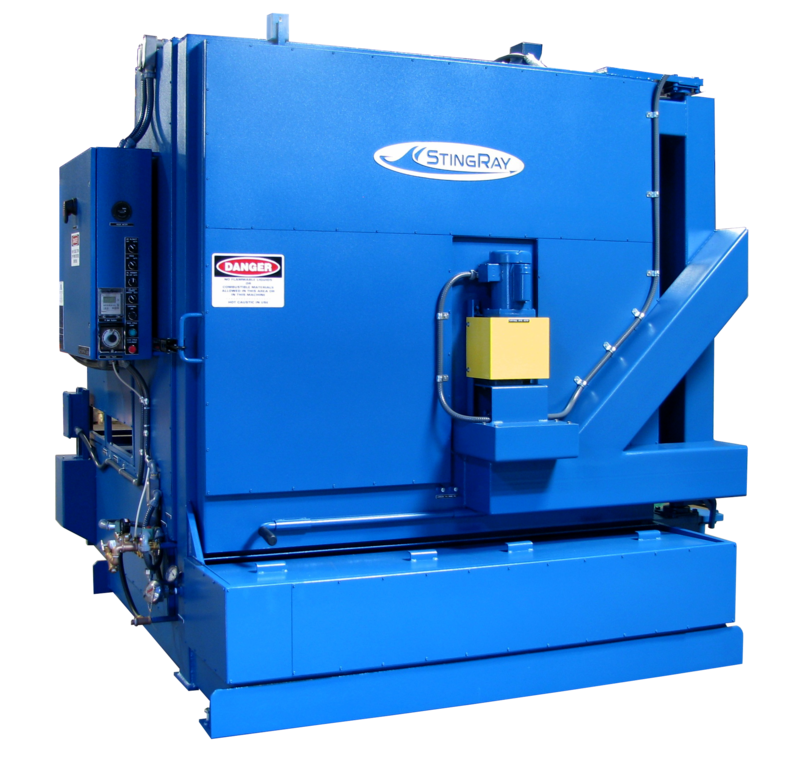 The loads are fully carried by the parts washer and require nothing more than anchor bolting the machine to the floor. StingRay offers many capacity options and lengths to fit your needs. 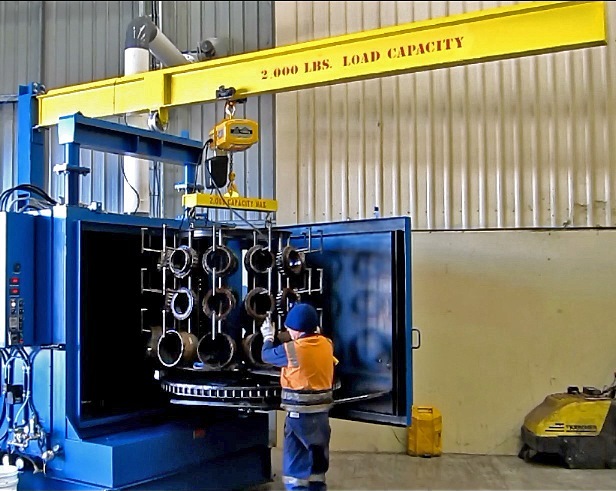 All StingRay booms meet ASTM requirements for jib cranes, providing safety factors according to crane standards and are tested at the factory prior to shipment. 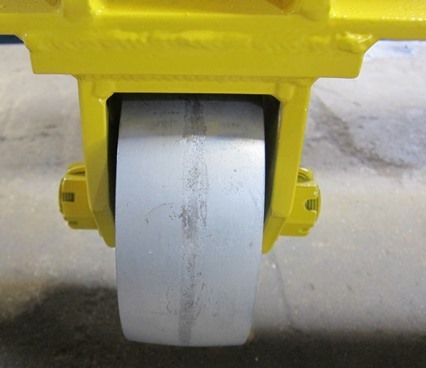 Graded structural steel to ASTM A36 and load rated fasteners are used throughout. All welding is in accordance with AWS D14.1. 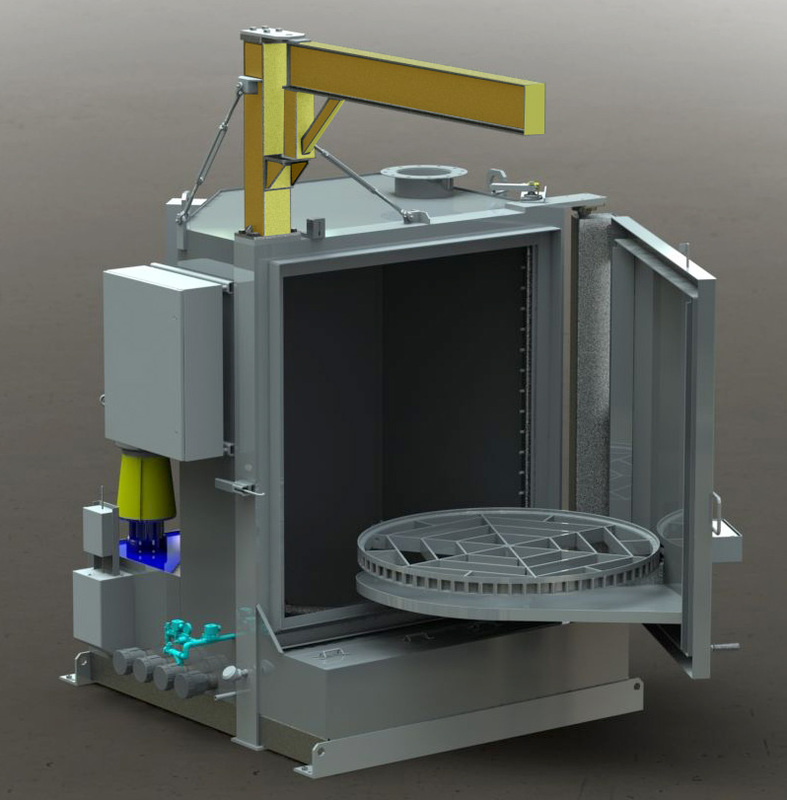 Crane configurations for aircraft wheel washers or diesel engines are available. Add a hoist and electrical cable management with a festoon and integrated electrical power for your jib crane.